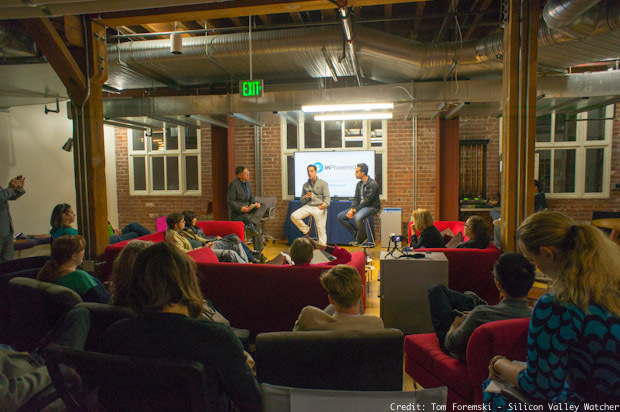 The recent SF Creators Salon focused on the topic of trust and content marketing and as usual, it was a lively evening hosted at InPowered’s community space in San Francisco. I Interviewed the two founders, the brothers Peyman Nilforoush and Pirouz Nilforoush (above), who are very much on top of this topic of trust and content marketing through the services of InPowered. The company helps client identify trusted media written about them and their products, and then it amplifies its distribution. Stories written about a product from a trusted, independent source such as a magazine or newspaper, are by far the most effective means of influencing buyers. InPowered’s research shows four times the effectiveness of trusted content over company produced content. It’s a huge difference that I can never tire of emphasizing this fact because it strikes at the heart of the current crisis in the media industry. The continuing loss of trusted, independent media brands is bad for society and its very bad for commerce. Bill Ziff made billions of dollars building trusted publications…. Prior to the main interview with the brothers, I interviewed Fred Davis, (above) a former senior executive at Ziff Davis when it was run by the legendary William Ziff. Fred worked very closely with Ziff as he built the largest privately held publishing group. His success, Fred said, was his absolute insistence on editorial quality untainted by any commercial influence. Readers trusted Ziff’s magazines and he made sure nothing eroded that trust. Ziff’s success has some important lessons for content marketers today. For example, Fred says that Ziff always insisted that content had to be completely led by the editorial team and there could be no fraternization with marketing and advertising sides of the business. Yet in today’s world, content marketing is nearly always led by the sales and advertising departments, which probably explains the poor quality of much of it. Also, Ziff spent millions of dollars on research showing the effectiveness of his magazine’s high quality, independent editorial in driving sales for advertisers. His near fanatical insistence on producing editorial of the highest quality, free of any commercial taint, resulted in terrific returns for advertisers. Ziff made a tremendous amount of money. And advertisers made money because they had a highly effective, independent trusted media platform to reach customers. The disruption of the media industry’s economics means that there are fewer, independent trusted sources of news and information. Many publications have closed or have been forced to accept promotional programs that call into question their independence — such as with native advertising. Every company now has to be a media company — whether they like it or not — and most would rather not. At the salon I said that, unfortunately, we will have to tear down the old order and we will have to relearn many of the basic truths about media publishing — the immense value of trusted and independent media publications. But the destructive nature of the disruption will create a nasty period of confusion and opportunities for special interest groups with nefarious agenda. We will eventually figure out the economics of the new media and we will again, have trusted, independent media companies with sustainable business models; so that every company no longer has to be a media company. It is a huge mistake for trusted publications such as the New York Times, the Wall Street Journal, and the few remaining trusted media brands, to accept native advertising. Native advertising is specifically designed to look and feel similar to independently produced stories. Anything that causes readers to question their trust in a publication, as native advertising does — is absolute madness. 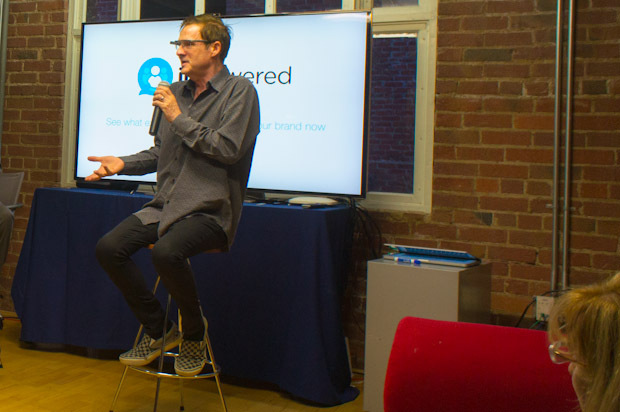 The lessons of Bill Ziff, and InPowered’s discovery that trusted content is four times more effective than paid content — is proof that native advertising is absolutely wrong for both the publisher and advertisers. Anything that erodes trust in the publication also erodes trust in the advertiser. It’s a loss for both parties. The first interview of the evening was with Carla Schlemminger (above), a long time member of the salon. It’s part of a regular series of interviews focusing on salon members (coming up Jane Evans Ryan and Heidi Groshelle). 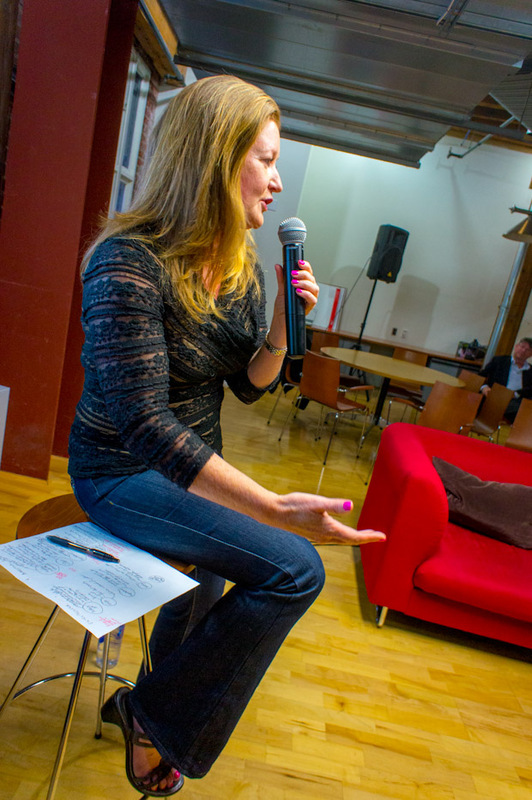 Carla is a San Francisco native and has worked in PR and marketing for many years, and has helped more than three dozen startups and larger companies, with product launches, strategic positioning, and media strategies. She shared some of the common mistakes she’s seen and gave a great presentation on how to avoid them. A key point was that companies wait too long before hiring PR and marketing specialists and there isn’t much time to do the things they want to achieve. They have a launch coming up in two weeks but the product isn’t ready and they have no social media footprint, and they want their CEO to be seen as a thought leader. - Trust your agent not to drink the corporate Kool-Aid. - Treat Marketing with the same import as you do Finance and Legal. - Align expectations with resources. - Retrench quarterly similar to what a pro athlete would do. My thanks to Robb Henshaw from InPowered for helping to make the event possible and the generous hospitality of the company. It was great to see Matt Greeley, CEO of BrightIdea; Dave Richardson, head of Impress Labs SF; and Tom Zimberoff, one of the world’s best photographers and now at the helm of a potentially revolutionary photo startup; plus many new people and new conversations. I can’t wait to do it all again.